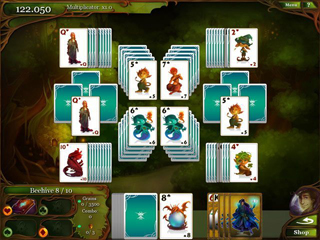 Magic Cards Solitaire Collector's Edition Game - Download and Play Free Version! Enter the magical world of Knoxford the Sorcerer! During an unsuccessful experiment, a small and unfortunate elf fell out of one of Knoxford the Sorcerer's many books. 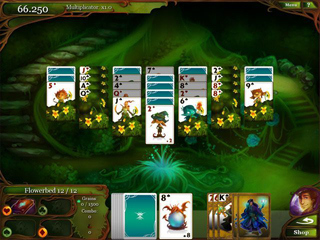 The only way back into the magical pages is to master many exciting solitaire adventures! 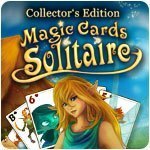 Make your way through many challenging levels of Solitaire to help the help find her way back home. In order to master all the challenges you must collect hidden items, find as many magical artifacts, win valuable trophies and solve thrilling riddles. Enjoy a brand new level, wallpapers, concept art, and most of all a newly integrated 'free play' mode! These brand new features can only be found in this Collector's Edition.